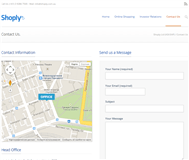 Shoply delivers value to consumers by providing great products at great prices. 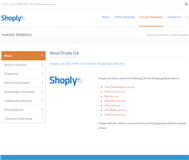 Shoply has an online shopping platform that is versatile, robust and scaleable. Your Home Depot is committed to providing our customers with premium brands and premium service. With over 35 years retail experience, they are supported by a team of experienced and dedicated staff who strive to provide their customers with the best possible service both in their online store and their SHOWROOM in Sydney. Shop online at Your Home Depot; Australia's leading retailer of kitchenware, cookware, home appliances, bakeware, kitchen knives & more! Best prices on a wide range of world class brands such as KitchenAid, Scanpan, Cuisinart, Vitamix, Global Knives, Swiss Diamond, Magimix, Led Lenser, Wusthof, Shun, Royal Doulton and more! Buy now for same day dispatch & free delivery*, find the best deals, sales and discounts online & in store. 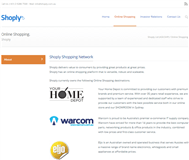 Warcom is proud to be Australia's premier e-commerce IT supply company. Warcom have strived for more than 14 years to provide the best computer parts, networking products & office products in the industry, combined with low prices and first-class customer service. Warcom, established in 2000 by Paul Warren is one of Australia's most trusted computer hardware e-commerce stores. They service clientel includes, students, mums & dads, small to medium-sized businesses, IT professionals, computer resellers, government departments, the educational sector and consumers that like to keep their finger on the digital pulse. At the Warcom website, their customer have access to the latest technology parts and products, along with detailed product information, pictures, how-to's, customer product reviews and opportunities to interact with Warcom staff, on the warcom blog. They view every customer as a customer for life and instill this philosophy into their employees to assure the complete satisfaction of every shopper. They are continually changing to satisfy their consumers appetites for the 'latest and greatest' computer and electronic devices. They work around the clock to update their site with the hottest products, useful new features and reliable content. From browsing their intuitive and information website, to purchasing and delivery to your door: we utilize the latest e-commerce and Internet technologies to provide real-time order status information, tracking numbers, safe and secure SSL encrypted transactions and much more. And, with warehouse locations in Victoria, New South Wales, and Queensland, we will get you your products fast. In fact, 99% of our orders ship same-day. Eljo is an Australian owned and operated business that serves Aussies with a massive range of brand name electronics, whitegoods and small appliances at affordable prices. Ezy Direct focus on offering Australian businesses, organisations, schools and the general public, the best possible prices on an ever growing range of electronics, stationery and home & office essentials. Founded by Melbourne based Entrepreneur, Christian Gibson, Ezy Direct was born 2005 with a strong focus on offering Australian businesses, organisations, schools and the general public, the best possible prices on our ever growing range of electronics, stationery and home & office essentials. As an online store, not only do they offer discount prices across their range, but they also understand the importance of customer service, fast delivery, secure buying and reliable policies regarding personal data, returns and warranties. By shopping through Ezy Direct you are assured of getting the best possible prices, with top quality service through secure channels! In 2013, after delivery more than 50,000 products to satisfied customers in every corner of Australia, Ezy Direct became part of the AER Group Pty Ltd. Under a new management structure, their website, prices and customer service are better than ever so that we can always make sure their business, government and private customers are happy with their quality products and customer service. OHKI was established to bring back genuine competition and customer satisfaction which they believe has been lacking with not only larger chain retail stores, but also with online businesses. Wow Baby is a community driven baby product retail environment. Wow Baby was establish in October 2010 by a husband and wife team and since then has grown significantly through a 'customer comes first' philosophy. WOW baby raises the benchmark when it comes to customer service on a continual daily basis. Today, Wow Baby is owned and operated by the AER Group Pty Ltd who continue to maintain the high standards of customer service and product expertise, as well as always having a broad range of products – all meeting strict safety guidelines, with reliable delivery at great prices! Wow Baby is a community driven baby product retail environment. What exactly does this mean? It means that they are not just a baby store trying to make sales. They are a business committed to its customers and like to believe that each and every customer of Wow Baby not only stays loyal to Wow Baby, but becomes a member of the Wow Baby community. No matter the size of the order or the distance of the delivery, Wow Baby staff are focused on customer service as a number one priority, your satisfying and hassle-free experience with us is the driving motivator of our entire business. Toy Store is an Australian online toy store selling great products like Barbie, Nerf, Thomas the Tank Engine. Welcome to ToyStore.com.au; your one stop online shop for all your toy needs - whether it be birthday gifts, Christmas presents, or just something fun and exciting for the children in your life! Toy Store operates exclusively as an online shop; which means we can provide the best prices possible on our entire range and deliver products to your door, quickly and reliably! Toy Store is owned and operated by the AER Group Pty Ltd who are Australian leaders in online retail. This means that you can be assured of getting genuine products at amazing prices and with unparalled service.